Hello! 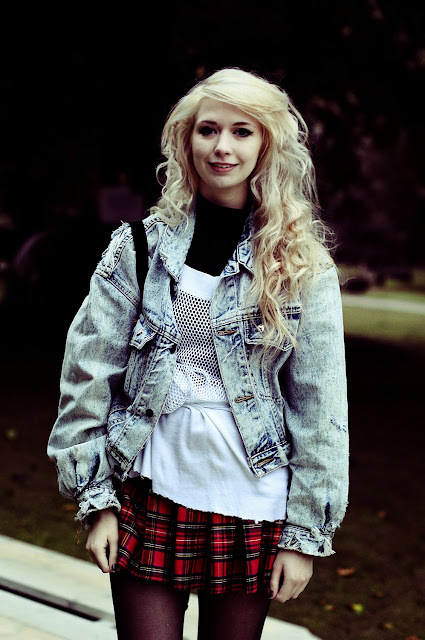 This is the outfit which I wore to Meadham Kirchhoff (previous post). I continually go through thinking that I shall never wear my creepers again, to wearing them again, multiple times. I really want to buy some more platform shoes. I’m currently loving platforms with white rubber soles, they are really cool- But they’re all so expensive, I must search through hundreds of ebay pages to find some cheap ones! The skirt I’m wearing is from Tammy, I’ve had it since I was twelve! Its a bit short now.. oh dear. Aw love this outfit, ahaha I remember shopping at tammy when I was younger. Lucky tat you can fit 12 year olds clothes. I'm a secure size UK10 in adults, so I have no chance with my old tammy clothes even if I had kept them! Love the skirt, you look very cute! Great style, love all the different layers 🙂 Meadham Kirchoff looked incrediblae, I'd love to see one of their shows! Im buying a skirt like that too!!! You can check my blog if you want!! I post OOTDs as well! amazing outfit!! was thinking of upcycling a jacket like that?